Brighouse Town let two more points slip in a 2-2 home draw with Cleethorpes Town yesterday and dropped to fourth place in the Evo-Stik NPL East section. 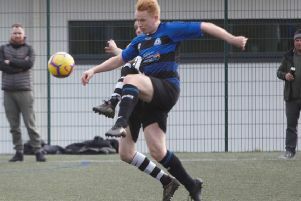 The Hove Edge side got a flying start with a goal from Kurt Harris after four minutes but were unable to build on that with three second-half spot kicks accounting for the game’s other goals. Goalkeeper Jordan Porter was named captain for the day in the absences of leading scorer Aaron Martin (groin) and Adam Field (knee). Zeph Thomas came in up front. The home side drew first blood from a corner. Reece Jenkinson’s header was parried by the keeper to Harris, who made no mistake. Mohammed Ibrahim and Jack Normanton missed golden chances to extend the advantage but it remained 1-0 until Scott Vernon replied with a penalty for handball on 49 minutes. Home boss Vill Powell sent on Gabriel Johnson, Tom Robinson and Jack Smith in the quest for a winner and it looked like Brighouse may have got one on 72 minutes when Thomas sent the keeper the wrong way from the spot after Johnson had been hauled back. However, the lead last only four minutes before Vernon struck again after Porter had pulled down a Cleethorpes player and the visitors had the better of the second half. Powell’s side only have one win in their last five games but could climb back into third place with victory at Marske United on Tuesday evening. That promises to be a tough game with the North Yorkshire side eighth in the table and 3-0 winners at Stamford yesterday.